A Cyclocross race takes place on man-made courses through neighborhood parks and open fields, and involves maneuvering over barriers, through the mud, snow and rain. This style of racing requires a special set of skills that stem from racing mountain bikes, road bikes and, to some extent, running. Athletes are preparing themselves for the unique demands required of this sport. As with any sport, it’s important to train specifically to the demands of cross racing. Are you prepared for the cyclocross season? 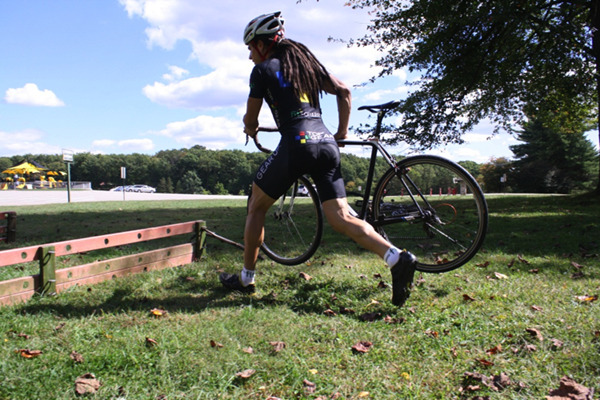 Cyclocross courses are usually about 2-3km in length, and usually involve many sharp turns, short steep hills, and barriers that either involve hopping over while on the bike or dismounting and running with the bike in hand. The duration of most cross races is between 45-60 minutes, and that time is spent working as hard as you can, with most of the effort very close to and above your 20 minute threshold heart rate (top end of Zone 4 or Zones 5A/5B according to Joe Friel’s heart rate zones). 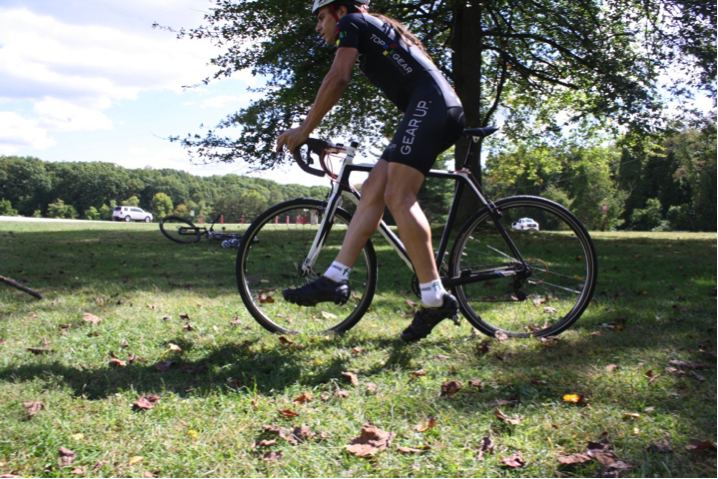 Cyclocross racing also consists of many 10-30 second powerful sprint efforts through the duration of the race. Every time you exit a turn, you need to accelerate, and that takes a combination of short bursts of power. Within the duration of a one hour cross race, there could be as many as 150-200 short bursts of power needed to complete the race. Finally, leg speed is also important, due to the fact that most of these races are on grass and at times in wet, snowy conditions. Wet slippery conditions make it hard to work with a lot of force, resulting in the need to work with a faster cadence. When training for (and during) cross season, it is thus important to focus on increasing your two- and five-minute power outputs combined with your 10- to 30-second peak power levels. It’s also important to work on cadence. These focuses will help you prepare the specific systems needed to excel at cross races. When there are no cross races on the weekends, training weeks should consist of two to three days focusing on intensity and shorter efforts. Space each intense day with recovery: an easier day spinning in zones 1 and 2, or a rest day. If you have a “B-level” cross race that week, then do only one day of training one to two minute intensities during that week. You never want to take too much training stress into a cross race, as that will not allow you to get the most out of the race effort. Here are two examples of cross workouts that can be used during training weeks throughout cross season. These workouts are best done on the cross bike you will race on. Best done on a long stretch of road or gravel road. This workout will help you be handle the sustained, repeated threshold efforts during a cross race. 5 minute effort going from the upper end of zone 4 and finishing in zone 5A heart rate range – Work with a mix of standing and seated. Choose sections of road, gravel of grass for these efforts. 10 minute recovery in zone 1/2. Repeat 3x for a total of 1 hour of efforts and recovery. 30-minute cool down spinning easy. 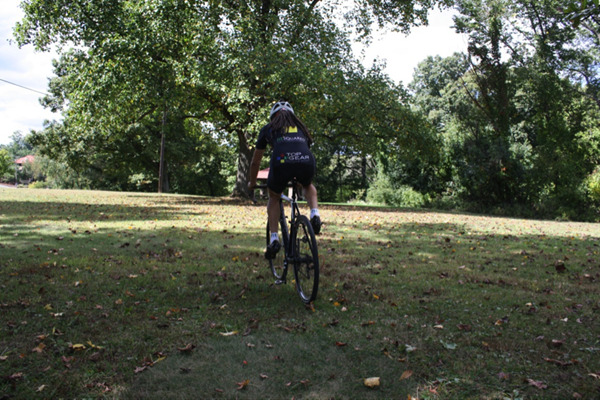 Can be done on roads and gravel but best done on grassy areas similar to a cross race. This workout will train your leg speed and ability to “explode” out of turns and throughout the race. Race Pace 30-60 second efforts: At the start of the effort, shift into a slightly harder gear and stand into a 5 second explosive effort. Then sit and spin with a fast cadence for the remaining 30-60 seconds at race pace (On a PE scale of 1-10, you’ll be at 8 – 9). Spin easy for 30-60 seconds. 10-minute recovery by spinning easy. Practicing dismounts can be added to this workout during these recoveries. Practice with a barrier to work on timing of the dismount. (More on dismounts below). Repeat these rounds of 2-3 race-pace efforts and 10 minute recoveries for an hour total (about 4 rounds). 30 minute cool down spinning easy. Note that in both workouts, the easy spinning between these efforts is important. It allows you to recover from each effort so that you can perform each effort with a higher average power output. Over time, this will cause your body to adapt to these short intense efforts. Technique is also a large part of being successful at a cross event. The biggest challenges are dismounting the bike, running with the bike in hand while jumping over barriers, and remounting the bike. This is all done while within a pack of fast-moving racers all looking to make a pass. One mistake can cause you to trip, fall, and wreck or at the least, cause a slow transition. During training weeks, focus on technique at least twice per week. Practice skills when riding easy or in a separate training session so that you can learn good technique. Go to a local park where there are open grassy areas and set up one or two sets of barriers at 40 cm in height, spaced 4 meters apart, and wide enough for one or two people to use at once. Practice 2 rounds of 10 dismounts, running with the bike, and 10 remounts at a slow pace. Then practice 2 more rounds of 10 dismounts and remounts with increasing speed. Take 5 minute easy spin breaks between rounds to recover. Discontinue the efforts if and when your form becomes sloppy. Now let’s hone in on the proper way to dismount, run with the bike, and remount. There are two main ways to dismount. Method 1, the least technical way to dismount: Approach with hands on brake levers or on the tops, unclip the right foot (or left if using opposite side), swing leg over, grab top tube with right hand while left hand remains on the handlebars, and put weight through to the right arm to maintain balance. 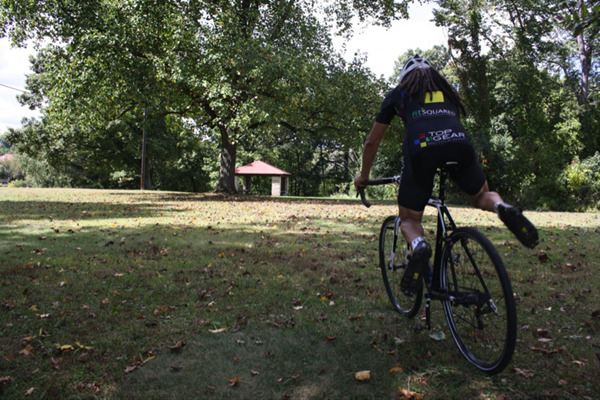 Then unclip left foot as you place your right foot on the ground behind your left leg, pick up the bike and begin to run with the bike, carrying the bike by the top tube with your right hand (or over the shoulder – not pictured), and with the left hand on the handlebars. Method 2: More technical but faster. This method allows you to dismount closer to the barrier and maintain more speed. Use the same method as above, but this time after unclipping with the right foot (or left), and grabbing the top tube with the right hand, swing the leg through between your left leg and the bike. Then as you plant the right foot, unclip your left foot at the same time, land on your right foot and begin to run. Use the method you are most comfortable with until you can master both. There may be a time and place for both. 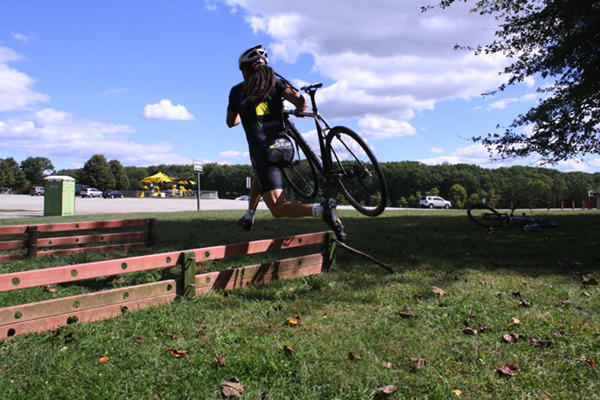 You also want to know the best time to initiate a dismount, so practice with barriers. Starting the dismount too late could lead to running into the barrier with your front tire which could lead to a wreck. 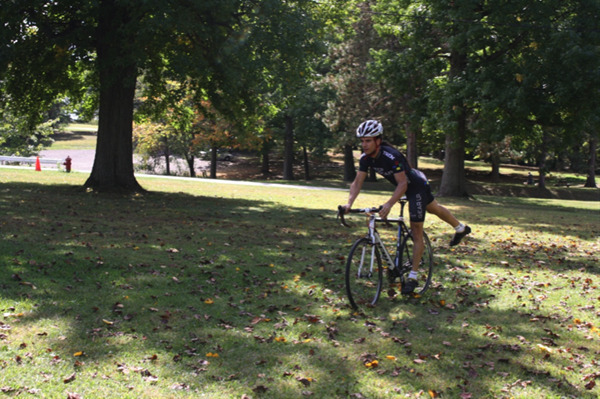 After you dismount, you then need to clear the barriers and run with your bike. Your hand should already be in the correct position, on the top-tube, after dismounting. You then need to lift the bike in the air, and run with the bike while clearing the barriers. Notice in the photos how the seat is not tucked under the arm pit to allow the bike to be carried higher. Remounting the bike is as hard, if not harder than the dismount. 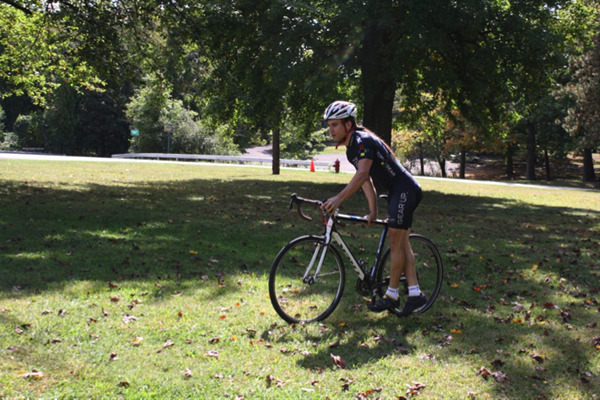 In a race, you want to remount the bike in stride while moving fast. 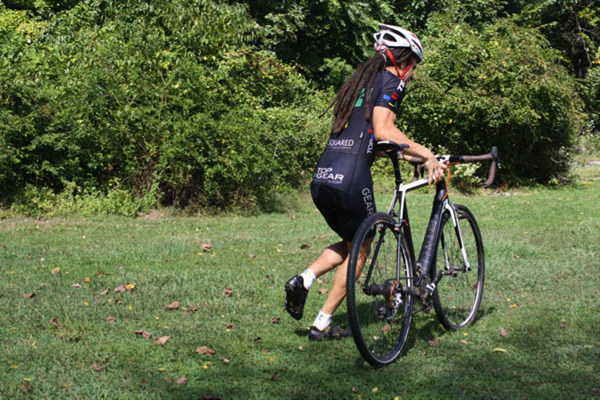 The first step in remounting the bike is placing the bike on the ground gently after you clear the barriers, while running in stride alongside the bike. Once the bike is on the ground, place both hands on the tops of the handlebars or the hoods, take a few more steps in stride, and spring onto the bike off of one leg so you land onto the seat gently. If you are throwing your right leg over the bike you want the inside of your right thigh to slide over the top of the seat as you move onto the bike and begin to pedal. Two to three days a week of working short, intense efforts like my two suggested workouts above, with recovery or rest days spaced in between. During “B” race weeks, only one day of working short, intense efforts. Practice the provided technique drills two times a week during separate training sessions, or on recovery days. When the starting gun sounds, it is a sprint to the finish. The better prepared you are in all aspects of cross racing, the better you will feel, and the faster you will finish.